The team is starting site work this year but construction of the center won't start until next summer. Additional fundraising is needed to build the center. A contractor will be chosen soon to start work on the site by mid-November. There will be a groundbreaking event for the $40 million Hanford Reach Interpretive Center today in Columbia Park West in Richland. Jones & Jones Architects, Landscape Architects and Planners is architect and landscape architect. No general contractor has been chosen. The team will advertise for bids in the next 10 days and the contractor will likely begin work on the site by mid-November. Bruce Arnold, senior associate at Jones & Jones, said the first phase is valued at about $3 million and includes roadwork, utility work, excavation and grading. The second phase will be the two-story, 61,000-square-foot center and associated improvements. Richland Public Facilities District is building the center to become a gateway to the Hanford Reach National Monument. 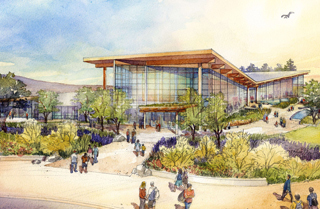 The center will have indoor and outdoor classrooms, about 12,000 square feet of permanent exhibits, 3,000 square feet of gallery space for temporary exhibits, a 40-seat theater, cafe, gift shop and amphitheater. Today's event is the ceremonial groundbreaking for a project that has been planned for a decade. Arnold said the celebration will honor the many people who have been part of process. The city of Richland's Public Facilities District is primarily responsible for the project. Other team members include the cities of Kennewick and Pasco, nearby counties, the state, regional tribes, Federal Highway Administration, U.S. Army Corps of Engineers, U.S. Department of Energy, the U.S. Department of Fish and Wildlife, and a number of politicians. Arnold said the project demonstrates the new realities for architects and others in getting big projects funded. “Nobody by themselves has a dollar stream big enough to pull off big ideas so everyone has to roll up their sleeves and come to the table willing to work with one another to bring expertise and pull it off,” he said. Holding a celebration now makes sense, Arnold said, because permits for the first phase have been obtained, the weather is good and more fundraising is needed for the second phase. He said getting approvals from all the entities involved was a “herculean task” that took many years. Selecting the contractor, he said, will be easy in comparison. Arnold said one reason the center has taken a decade to start work is because it was important to get it right. The Hanford monument is difficult to access. People must travel on undeveloped roads or take a boat up the river. The DOE site at Hanford is also strictly controlled. The center will make it easier for people to learn about the cultural history of the region. It is expected to serve 65,000 visitors a year. “You can't just go there and experience it so there had to be a lot of work put in place to figure out how to tell the story and how to fulfill regulatory requirements for public access,” Arnold said. Exhibits will focus on the Columbia River Basin, from its origins to the present, including Ice Age floods and early Native American life. The goal is to tell the story of the Hanford Reach, a 50-mile stretch of the Columbia that goes from Priest Rapids Dam south to the Tri-Cities. The reach is the only free-flowing section of the river in the United States, and is important for salmon habitat and natural ecosystems. The center will have exhibits about Hanford Engineer Works, the mostly decommissioned nuclear production complex on the Columbia operated by the federal government. Established in 1943 as part of the Manhattan Project, it was home to the B Reactor, the first full-scale plutonium production reactor. After World War II, Hanford crews continued to manufacture plutonium and other nuclear materials, and also participated in reactor research and development. At peak production, nine reactors were in operation there. In 1989, DOE, the state Department of Ecology and the Environmental Protection Agency agreed on a 30-year, multi-billion dollar cleanup to bring Hanford into compliance with state and federal environmental laws. The center will also tell the story of the cleanup. The corps owns the center site, which was selected after an earlier site raised cultural and historical issues. Other team members include Magnusson Klemencic Associates, civil and structural engineer; Sparling, electrical engineer and acoustical and technology consultant; O'Brien & Co., energy/environmental consultant; W.J. Higgins & Associates, envelope consultant; Clevenger Associates, food facility designer; Bartlett Design Co., interior designer; Candela, lighting designer; The Greenbusch Group, mechanical engineer; and Will Stewart Landscape Architect, irrigation designer. Katie Zemtseff can be reached by email or by phone at (206) 622-8272.